I’m already seeing too many articles about how to deal with excessive consumption at Christmas. My advice is simple, writes Dr Susan Aldridge, HS guest blogger and freelance writer and editor based in London, with an interest in medicine, health, science and food/nutrition. 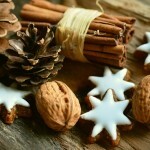 Use the season as an opportunity to give your food a festive touch by including a touch more spice. In this blog, I’m focusing on ginger and cinnamon, both of which contain some interesting phytochemicals which are good for your health. Ginger contains potent anti-inflammatory compounds known as gingerols. If you’ve been reading this blog for a while, you’ll know that I include ginger in every juice I make. You can also make it into a tea, by merely pouring boiling water onto a few thin slices of peeled root ginger. Add a pinch of turmeric and/or squeeze of lemon if you like, to make a healthy hot drink. Cinnamon is the inner bark of the tree of the same name. The bark is either used direct, in stick form, or ground to make a powder. The characteristic festive odour of cinnamon comes from the compound cinnamaldehyde, which is thought to be responsible for its glucose-lowering properties (below). It also has anti-bacterial properties, which is why cinnamon oil/candles are good to burn in the winter months – they might help you ward off colds and flu. Like ginger, cinnamon is also rich in antioxidant, anti-inflammatory phytochemicals. A sprinkle of cinnamon goes well with a healthy breakfast of Greek yoghurt and blueberries. Studies suggest that an intake of up to two tbsp. per day of cinnamon may help reduce blood glucose and increase insulin sensitivity, which could help prevent Type 2 diabetes. I made a discovery here – frozen mixed berries contain redcurrants and blackcurrants which are hard to source at the greengrocers. They work better in a smoothie than a juice, so this has to be made in two stages – extract the ginger into a juice which is then added to the smoothie. Defrost the berries. Take a handful and juice with the ginger. Then make a smoothie with this juice and the rest of the berries. Top up with pomegranate juice. My mother used to make a delicious carrot and ginger soup. This is an extended version with more veg from the orange part of the spectrum and some pulses for added protein. Fry all the peeled vegetables with the ginger and cinnamon till softened. Add the tomatoes, pulses/lentils and herbs and simmer till pulses/lentils are soft. Top up with vegetable stock if the mix is too thick. You can serve this chunky or blend with a hand blender for a smoother soup. When I cooked my first vegetarian Christmas dinner, friends joked about my ‘walnut turkey’. The recipe for my festive nut roast is slightly different every time and, this year, I’m returning to the walnut theme – not forgetting to add some cinnamon. Don’t wait for Christmas day – I’m rehearsing my walnut turkey this weekend! Fry the onion in the coconut oil till soft, then add the mushrooms and cook for another 10 minutes. Add the spinach and stir till wilted. Make a paste with the Marmite and tomato puree in a little boiling water and add this to the vegetable mixture, with the tin of tomatoes. Set aside to cool. Stir in the Weetabix crumbs, nuts, cheese, herbs and cinnamon. Add the beaten eggs. Stir until well mixed and transfer to a loaf tin lined with greased foil. Bake for around an hour. I served this with onion gravy, Brussels sprouts and carrots in the rehearsal meal. On Christmas Day, I’ll make a tomato and cranberry sauce and add roast potatoes with rosemary to the vegetables.